DisplayPort to VGA Female Adapter, 6"
Mini DisplayPort Male to HDMI Male cable will allow your Mini DisplayPort equipped laptop to connect to your HDMI device. This Mini DisplayPort Male to VGA Male cable will allow your Mini DisplayPort equipped laptop to connect to your VGA device. 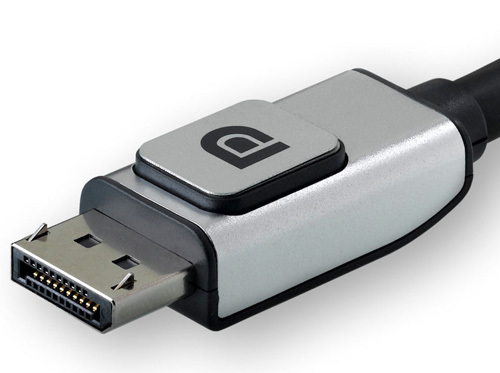 Use a Mini DisplayPort PC or Mac with your existing VGA monitor. Allows to connect a Mini DisplayPort-enabled laptop (MacBook, MacBook Pro, MacBook Air) to a standard DisplayPort monitor. DisplayPort Male to VGA Male Cable Connect the VGA port on your HDTV or monitor directly to your DisplayPort source device without any extra adapters. Connect your DVI monitor to a DisplayPort-equipped computer using a single cable. Display Port cables are mainly used for HDTV, DVD player, STB, PC monitor etc digital audio, video appliance. Mini DisplayPort Male to DVI Female Adapter. Supports up to 1920x1200 resolutions (single link). Mini DisplayPort Male to VGA Female Adapter. Connects MacBook, MacBook Pro, or MacBook Air with mini-DisplayPort to flat panel monitor, LCD, HDTV's, STB, DVD or projector with VGA video port. Supports both video mirroring and extended desktop modes.